Thank you @DMJ8321 for tweeting this information. On tour bus w/@scottymccreery in KC for upcoming @todayshow segment. Enjoyed the visit. Have a good show tonight. Scotty McCreery, nominated for this year's "New Artist of the Year" Award in the upcoming 47th Annual Academy of Country Music Awards in Las Vegas, is honored over the recognition. He says, "I am pumped! Looking at the final eight in the category, everybody in there was so good. I listen to all of their music. So to be a finalist is an honor. It's been an incredible year. Being up for this award means a lot to me. I am ready to head to Vegas!" 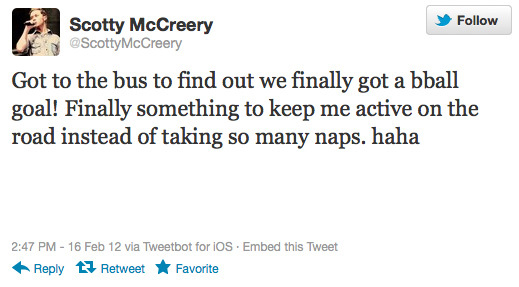 McCreery also took time to thanks his fans for his latest honor. Voting for the "New Artist of the Year" award takes place at VoteACM.com beginning on March 19 at 12 PM, ET. In addition, look for an interview with Scotty featured on GAC's ACM New Artist of the Year special that will premiere that same night at 9 PM, ET. 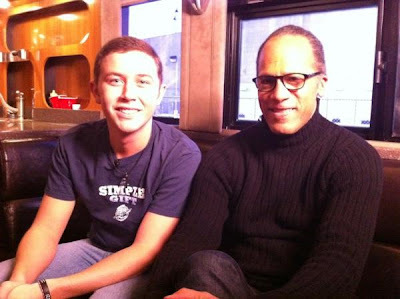 Last year's "American Idol" winner Scotty McCreery grew up listening to a few idols himself. "The rest of the kids were listening to stuff like the Backstreet Boys. I was listening to Elvis," he said from a tour stop in Eugene, Ore. There's been a whole lot of shakin' going on since the deep-voiced 18-year-old from Garner, N.C., was announced the winner on the "Idol" finale last May. McCreery, also schooled on Merle Haggard and Johnny Cash, followed last summer's "Idol" tour and his first single, "I"Love You This Big," with his first album, "Clear As Day," last October. It debuted at No. 1 on the Billboard Top 200, the first debut by a country http://www.blogger.com/img/blank.gifartist to do so. It has sold 1 million copies and yielded his second hit, "The Trouble With Girls." No trouble here. McCreery recently was nominated for an Academy of Country Music award for best new artist (they'll be handed out April 1), is working on new songs, and recently recorded "a separate project that hasn't been announced yet." Unlike many of today's new country stars, he's not looking to branch out into other things anytime soon. "As of right now, I'm strictly country. I (want to go) as far as I can in the business. I'm going to give it my best shot," he said. "Doing that, I keep in mind I have a family back home and a hometown I love," he added. "I don't want to be that guy that spends 300 days a year on the road. That's not me. That's not who I am. But I'll give it my best shot and see how it goes." For many headliners, an act who has charted with one or two songs makes an able opener. After all, tradition finds opening acts hired primarily to just warm up a crowd so it is ready to respond with gusto to the headliner. Thursday’s show spotlighted a magnificent array of talent, including both opening acts. In fact, the venue was almost full by 7:30 p.m. — despite Lubbock concertgoers' rarely worrying about missing an opening act. True, there were a lot of teenagers in the house, and why not? 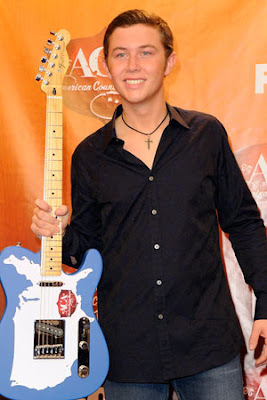 Opener Scotty McCreery won’t celebrate his 19th birthday until October, and many watched him win the tenth season of “American Idol” in May 2011. But this is no kid singer. Don’t mistake him for one. Sounding like a deep tenor, McCreery was very much at home on stage. Sales of his debut album have gone through the roof, but he’ll need songs better than “I Love You This Big” and “The Trouble with Girls” to maintain this dream-come-true success story. Still, McCreery possessed the personality and vocal hooks necessary to provide an entertaining 25-minute opening set. It is far too early in the year to award any prizes to this concert by Paisley and company. It is fair, however, to say that he has set the bar high for those who follow. Scotty McCreery, who won "American Idol" last year, calls his first post-"Idol" tour with Brad Paisley "a huge learning experience." "It's a lot of fun," he said from a tour stop in Oregon. "I go out there every single night, put on my ball cap and jeans and watch Brad Paisley. Every night's different. He puts on a great show. I'm learning so much. I'm having the time of my life." McCreery is the greenest member of Paisley's "Virtual Reality" world tour, which touches down tonight at NMSU's Pan Am Center. The show, which also features the Band Perry, sold out all 9,000 tickets two weeks ago. It's not only a commercially appealing triple-bill, which the Seattle Times called "probably the biggest country show of the year," it's also a snapshot of country music today. It's steeped in tradition but the lines between traditional country and pop have become blurrier these days. He's joined on tour by two of the music's hottest young acts, who have gotten even hotter since the tour was announced last fall. "They were booked right when they were on the cusp of breaking out," said Bobbie Welch, booking and marketing coordinator for NMSU Special Events. "Whoever put that together was right on," she added. McCreery, 18, is on his first proper tour since last summer's "American Idols Live!" trek. His debut album, "Clear As Day," came out a year after the Band Perry's album. It's already sold more than 1 million copies, and was the first album by a new country artist to top the Billboard 200 album chart in its first week of release. McCreery appreciates it. The Garner, N.C., grew up on a steady diet of Elvis, Little Richard, Haggard, Cash and Twitty. He's got a low tenor that's older than his years, but he likes new sounds, too. "I'm trying to have a mix of the old-style influence but keep it contemporary and up to date with today's music. Country is going more mainstream," he said, noting that both he and "Idol" runnerup Lauren Alaina are country artists. "It's cool to see that 'Idol' wasn't strictly country fans. People all over the country were watching," he said. "It ended up a country finale." McCreery plans to learn as much as he can from the accessible headliner. One particular observation stands out. "It's definitely the way he conducts himself, feeling the music and connecting to the crowd," McCreery said. "He's one of the best I've seen." Did you find a Group Day favorite? • Wednesday night, Scotty McCreery tweeted about his experience in the Hollywood rooms, which turned out to be pretty nerve-wracking for someone who was already considered a favorite. "Last year I was in room 1 first," Scotty writes. "Then a producer came and took me out and walked me to a different room. A lot of the people who did really good during Hollywood were in room 1, so we all felt really confident. It was the same day I forgot the words to my song, so when they moved me, I knew I was going home. I was so scared! Haha. Both rooms got thru tho, n the producer said they just felt like playing a joke on me. It was funny tho! Those producers were the bomb. but that joke definitely made my heart drop, haha."